Shortly after lunch on November 27, 2003, Oberon Houston was in his office beneath the helideck of BP's Forties Alpha oil platform in the North Sea, off the coast of Scotland. One of a select group (1 percent of BP's staff) of young engineers and managers targeted by the company for rapid advancement, Houston, 34, was working out maintenance plans for the coming week when he heard what he thought was a deafening explosion. Only it wasn't an explosion. A gas line had ruptured-allowing thousands of pounds of pressurized gas to escape at supersonic velocity. That caused a thunderous sonic boom. Debris from the burst pipe and its cladding rained down, adding to the impression that "an artillery shell had just hit the platform." The escaping gas quickly formed a huge and potentially lethal cloud around the rig. Now the threat of an actual explosion was very real. The smallest spark would detonate more than a ton of methane gas. No one died or was even hurt that day on Forties Alpha, thanks in part to high winds that helped to disperse the gas after about 20 minutes of extreme danger to the platform and its crew of 180 people. But Houston, the number two in command aboard Forties Alpha, knew full well what could have happened. "Unlike a similar incident on the ill-fated Piper Alpha platform," he observes, referring to an earlier accident in the North Sea, "the gas did not ignite, so what could have been a major disaster for myself and everyone else on board was averted by sheer luck." The Piper Alpha disaster took place on July 6, 1988. One hundred and sixty-seven people perished in a giant fireball on the rig operated by Occidental Petroleum. Only 62 crew members survived. In immediate loss of human life, Piper Alpha stands to this day as the worst disaster ever in offshore drilling and production-far exceeding the 11 killed in the massive explosion that destroyed the Deepwater Horizon platform on April 20. Though Forties Alpha could have produced a similar conflagration, it was nothing more than a near miss which was soon forgotten. BP admitted breaking health and safety laws by failing to guard against corrosion on the ruptured pipe that allowed the gas to escape. It was fined $290,000. The bigger loss came in early 2004. Houston resigned, and BP lost one of its best young engineers. This was not a snap decision for Houston. It came out of a growing disillusionment with the company. In looking back over the last few years at BP, Houston was distressed at the way that corporate downsizing exercises seemed to target the best and most seasoned engineers. He was further distressed that BP had slashed the maintenance budget for the vast and aged Forties Alpha platform to a dangerous, even reckless extent, providing the platform's operating engineers with less than 80 percent of the money they considered necessary to ensure the rig's safety. He regarded the fine as risible and worried that it would only reinforce the prevailing complacency within the company. And finally, he told me over the course of several interviews, he was distressed by an abundance of rhetoric-coming from the CEO-about BP going "beyond petroleum" and joining the environmental activists in campaigning for reduced carbon emissions. "To me and everyone I knew, it didn't make any sense. We were a petroleum company. That wasn't going to change any time soon, and it wasn't anything to be ashamed of, either. All the talk about windmills and solar power was just PR and a lot of nonsense." In short, Houston no longer trusted the company to do the right thing. As someone who grew up idolizing the company, he came to the reluctant conclusion that BP itself was an accident waiting to happen: It was taking on increasingly ambitious exploration and production challenges, while demonstrating an increasingly indifferent or cavalier attitude toward engineering discipline and excellence. On top of all that, senior management seemed less than fully engaged in the difficult task of extracting and producing petroleum. "For some time," Houston writes in an article on -conservativehome.blogs.com, " I had been dissatisfied with the way senior BP management focused so heavily on the easy part of safety, holding the hand rails, spending hours discussing the merits of reverse parking and the dangers of not having a lid on a coffee cup-but were less enthusiastic about the hard stuff, investing in and maintaining their complex facilities." To put it even more bluntly, BP was taking a don't-sweat-the-big-stuff attitude toward safety. Others noticed the same thing. Robert Bea, a professor of engineering at the University of California, Berkeley, and a well-known expert on catastrophes involving complex systems, reached the same conclusion based on his own association with BP in 2002 and 2003. At the company's request, Bea studied BP's approach to catastrophic risk management at its U.S. facilities in Texas City, Prudhoe Bay, and Cherry Point, Washington, and made recommendations directly to John Browne, then CEO of BP, and other members of top management. "You are spot on. BP worried a lot about personal safety-slips, trips, and falls-high frequency, low consequence accidents. They did not worry as much (at all) about the low frequency, high consequence accidents-the real disasters. Different categories of accidents require different approaches." In subsequent interviews, Bea told me that BP had paid promptly and well for his report, but he saw no sign that they were prepared to act any differently than before. About two years later, on March 23, 2005, BP had a major explosion at its Texas City refinery that left 15 people dead and more than 170 injured. Again, BP admitted breaking rules. This time it did not get off so lightly: It was hit with $137 million in fines-the heaviest workplace safety fines in U.S. history. Following the Texas City accident, an independent report on safety at the five BP refineries in the United States, known as the Baker Panel Report, came to pretty much the same conclusion that Bea had reached before the accident. As Browne, who retired as CEO in 2007, states in his memoir, published early this year, the Baker Panel found that "we had not done enough to make process safety a core value. We had emphasized that individuals had to be safe when they went about their daily work-'personal safety.' . . . But we had not emphasized that processes and equipment had to be safe under all circumstances and operated in a safe way at all times-'process safety.' "
those are its former CEO's own words. Bea, 73, has been investigating disasters for almost 50 years. After obtaining a master's degree in engineering, he joined Shell Oil and worked in jobs that ranged from roustabout to manager of the company's offshore technology development group. In 1961, an offshore military radar platform near New York City collapsed into the sea, killing 28 people. Shell asked Bea to look into the causes of this accident and report back with any lessons that might be useful to the company in setting up its first deepwater oil platforms. Since then, Bea has investigated more than 20 offshore rig disasters, and, as an independent researcher, he has also investigated the Columbia space shuttle disaster for NASA and the collapse of New Orleans levees during Hurricane Katrina for the National Science Foundation. He became a risk assessment specialist for Bechtel after leaving Shell and later moved to the engineering department at Berkeley, where he cofounded the Center for Catastrophic Risk Management in 2005, after Hurricane Katrina. The A in Bea's theorem, as he calls it, stands for all of the immense technical challenges that a complex engineered system must overcome in order to be successful over time-everything from earthquakes and hurricanes to "flying cows" (a favorite Bea expression). A includes all the difficulties and surprises that the external environment throws in your way, such as having to deal with the immense cold and pressure deep under the sea. The B stands for people and all of the faults to which individuals and human organizations are prone-everything from indolence or laziness to arrogance, hubris, and greed. B includes the panicky decision a manager makes when he decides to cut corners on safety-by ignoring or falsifying a test result, for example, or waiving one or more of a series of duplicative or triplicative precautions aimed at preventing a catastrophe-in order to stay on schedule and meet short-term financial objectives. To prevent D from happening, under Bea's unforgiving theorem, it is necessary to zero out both A and B as sources of failure. And in at least four out of five cases, Bea says, A doesn't cause disasters. The underlying design and technology is normally sound. The problem is with B-human or organizational weakness. And that is almost certainly the case in the Deepwater Horizon disaster. Bea and other experts have pointed out a number of deviations from normal oil industry practices-involving BP as the owner of the well and the supervisor of the entire operation, the Minerals Management Service as its U.S. government regulator, Transocean as the rig's operator, and Halliburton as a subcontractor-that put the rig in jeopardy. There were also danger signals-including evidence of a torn gasket and other problems in the Blowout Preventer (BOP), which is the last line of defense against a blowout-that should (in Bea's words) have prompted the reaction: "Stop. Think. Don't do something stupid." came during the still unfinished task of cementing down and sealing the so-called "nightmare well." To save time and money, the decision was made to remove heavy drilling mud and replace it with much lighter sea water. When that happened, the pressure of the column bearing down upon the wellbore no longer exceeded the upward pressure of the buildup of gas in the formation. The wellhead was breached. Then the BOP failed. End result: blowout, and an environmental as well as human catastrophe. In taking a risk that might have saved a million dollars, fallible human beings created a catastrophe that will cost tens of billions of dollars just to clean up and untold damage to people and wildlife, both in the Gulf and along other shores where the oil from the still uncapped gusher may land. For the simple reason that it designed the well and was in charge of the operation, Bea does not hesitate in fixing blame for the blowout on BP. But the real problem at BP, he says, began not weeks or months ago, but years ago. "It lost sight of the fundamentals." 'The time to embrace a clean energy future is now." So said Barack Obama in his televised address to the nation last Tuesday, June 15. And so said John Browne, BP's CEO, more than a dozen years ago in announcing his company's commitment to a clean energy future in a speech at Stanford University on May 19, 1997. In his memoir, Browne recalls this moment as a great turning point for BP and himself. In preparation for the speech, BP minions arranged BP-made solar panels in a great circle all around the university's open-air Frost amphitheater. "On this day," he proudly stated, "a Big Oil company broke ranks with the rest of the oil industry. We took our first tentative steps to going green." To a great splash of publicity, Browne launched a "rebranding" campaign three years later. What used to be called British Petroleum became BP, a moniker that cleverly fit the company's new motto of going "beyond petroleum." And BP changed its logo from the familiar BP shield to an environmentally friendly looking green and yellow sunburst. The company's values statement was revised to declare that BP would be "a force for good"-as opposed to, one must suppose, a force for evil. "The new helios logo and the line beyond petroleum expressed the new identity of the company. They gave a strong message that BP was intent on becoming a new type of global energy enterprise. We meant to tell people that we were ready to do more than they would expect when it came to confronting the difficult issues, such as the conflict between energy and environmental needs." With great big blobs of oil washing up on the shore, it is almost comical-no, it is comical-to see some of BP's erstwhile friends in academia and other centers of high-minded thought running for cover. To cite one example, thanks to BP sponsorship, 300 researchers in white lab coats at Berkeley are busily searching for ways to make green fuels that will reduce our dependence on oil. In 2007, BP set up the Energy Biosciences Institute, saying it would spend $500 million over the next ten years to support research into plant-based fuels at Berkeley and two other universities. This is the largest corporate donation ever for university research. Embarrassingly enough, Berkeley has an escape clause in its contract with BP. If anything were to happen on BP's side, such as "environmental despoliation," that would cause the university to violate its own principles in continuing the collaboration, the university could bail out of the agreement. In other words, with seven years to go on the grant, the university is at liberty to shut down the research lab and tell BP that it doesn't want any more of its money. "We don't want to sacrifice our research when it has such promise," said Graham Fleming, Berkeley's vice chancellor for research (quoted in the Sacramento Bee). Anthropology professor Laura Nader (sister of Ralph) will have none of that. "Your anthropology faculty told you this was a criminal corporation," she fulminated in a letter to the university's chancellor. "Listen to the anthropologists-we know some things that other scientists might not." I love her argument, but I am betting against Laura Nader in this fracas, knowing how easy it always is for those of a progressive mindset to accommodate their own self-interest within the framework of the loftiest idealism. "In order to know where to reduce carbon emissions, we wanted to develop a simple emissions trading scheme within the company. It would become the first of its kind. And the person instrumental in helping us set this up was Fred Krupp, head of the Environmental Defense Fund, an environment NGO. We had come full circle. This NGO had virtually single-handedly halted the construction of the Trans Alaska Pipeline in the early 1970s." 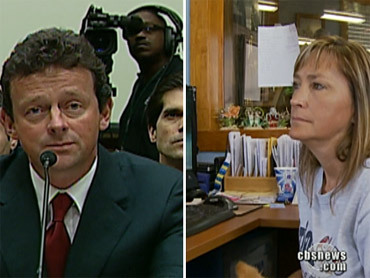 Browne later sold cap and trade to the British government, and Tony Hayward, his successor as CEO, has been trying to do the same with the U.S. Congress. Cap and trade would penalize coal and favor natural gas (of which BP has plenty, as witness the blowout). Through its lobbying efforts, BP has managed to make people like Nancy Pelosi aware that gas is a cleaner burning fuel than coal, even if it failed to tell them that it is-ahem-a hydrocarbon. The speaker demonstrated her ignorance of the energy business when she declared, "I believe in natural gas as a clean, cheap alternative to fossil fuels." For the record, cap and trade would do exactly nothing to increase domestic supplies of energy, and it could discourage domestic production of coal, which is in abundant supply. Though it is now the Democrats' favorite whipping boy, BP has extended its largesse in recent years to most of the party's bigwigs, including Democratic pollster and PR point man Stanley Greenberg and Rahm Emanuel, the president's chief of staff. Greenberg, the leading light at Greenberg Quinlan Rosner, is an equal opportunity geyser of left-wing environmental gibberish for politicians, NGOs, and the kind of business people who go along with the Obama brand of corporatist government in which big companies compete for government favors. The last time I looked, Greenberg still hadn't gotten around to taking down a page in his firm's website boasting of its work for BP. It tells of how Greenberg helped BP remake itself "as a company focused on transcending the energy-environment paradox." Shortly after Obama's happy inaugural, eyebrows rose slightly upon word that, as a House member, Emanuel had lived for the last five years rent-free in a D.C. apartment of Democratic colleague Rep. Rosa DeLauro of Connecticut and her husband, Stanley Greenberg . . . a prime architect of BP's rebranding drive as a green petroleum company. Last but not least perhaps, as Malcolm also notes, "BP and its folks were significant contributors to the record $750 million war chest of Barack Obama's 2007 08 campaign." According to Politico, "During his time in the Senate and while running for president, Obama received a total of $77,051 from the oil giant and is the top recipient of BP PAC and individual money over the past 20 years." If nothing else, the Obama administration's spiteful and vindictive treatment of BP should stand as a warning to other companies of the dangers of corporatism. To think as Browne did that you are gaining "a seat at the table" is delusional. The old mafia gag about a crooked cop as one "who won't stay bought" applies to politicians. They are perfectly happy to throw their corporate benefactors under the bus. This is especially true of this administration and this president, who seems to harbor a deep antipathy toward business and business people generally. In a recent Wall Street Journal column, Holman Jenkins makes the shrewd point that currying favor with politicians and seeking the approbation of one's critics is also an unnecessary distraction: "A company can't prioritize everything, and while BP was prioritizing PR and acquisitions, it wasn't prioritizing operations." "There is nothing the greens love," the English journalist and author James Delingpole observed recently, "more than a nice, juicy oil-spill disaster." He went on to say,If anything is going to cause more long-term damage to the planet than the gallons of oil being spewed out by the Deepwater Horizon drilling disaster, it's the toxic clouds of posturing cant and alarmist drivel billowing forth daily from environmentalists. Most especially from their cheerleader in the White House, Barack Obama. More ill-considered environmental policies, an increase in the arbitrary power of government, a decline in confidence in the competence of business-all of this could be more damaging in the long run than the oil spill itself.